We have 4x50Watt solar panels "A" mounted on a rigid frame on top of the Dodger (See Canvas), these add rigidity to the dodger and provide great power - up to 14 Amps per hour - maintenance free. On the cabin top we have two 5ft long teak handles "E" and two dorades "F". "K" shows the many double cheek blocks used to direct the lines to the cockpit clutches. Flush with the deck on both sides we have openings for both fuel tanks and both water tanks plus on the port side an opening for pumping out the holding tank. Bimini sail trim window "G"
Stainless Boom gallows with rubber insert "H"
Dodger with unobstructed views "I"
Dodger stainless handle for entering cockpit safely "B"
Dodger big smiley window "C" which has separate mosquito insert. 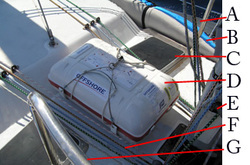 Traveller car operated from cockpit "D"
One of two permanently rigged preventers run to cockpit "J"
Just behind the mast at "D" we have our life raft mounted in a through bolted metal frame, just pull one snap shackle and throw overboard to inflate. Attached to the stanchions we have a fender board "A". On both sides of the side decks by the galley windows we have two through bolted pad-eyes, we used these for attaching our three windsurfers "B". We only moved our windsurfers here from the stanchions on the bow for long passages as I did not want the added windage or the extra stress to the boat if we faced heavy seas. Amid ships we have two gates boarding gates, both with attachment hardware for our boarding ladder and slightly forward are two large stainless cleats. Next to the tidy array of reefing lines and halyards "F" are two hatches "C" that open into the salon. A winch handle and holder on the mast is shown at "E" and part of the sissy bars is visible at "G"
The base of the mast sports a multitude of through bolted blocks to facilitate running all the lines back to the cockpit. Then we have two sets of stainless "sissy bars" which make working at the mast in heavy seas much easier and safer. Strapped on next to the sissy bars are our jerry jugs, we have two diesel, two gasoline, one specially for the 15Hp Mercury and a baby one for the 5Hp Nissan, these are covered with canvas for sun protection and black makes for less visual clutter. The stainless boarding ladder lives on the sissy bars when not in use and has the added advantage of providing an easy way of climbing on to the sissy bars to attach the main halyard. Also in this area we have the head hatch and two more large dorades.